Sapa is an old mountain station in the northwest of Vietnam, dear to the French since 1922. If you like hiking, you absolutely can’t miss seeing this valley that at first glance, will seem like a post-realistic painting. 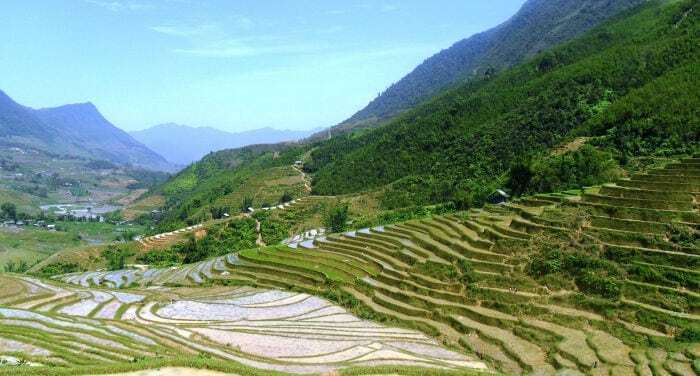 In fact, Sapa is surrounded by small villages of ethnic minorities and farmers dedicated to growing rice and other cereals and sweet hills with rice terraces in view. It’s an unusual and spectacular scenario. When to go to Sapa? The best period for visiting the town is from March to May or after the summer when there will be less rain. Despite being late into the rainy season with thick fog, I had the pleasure to also observe the mountain peaks on two bright days. If you don’t have the same good fortune, I can assure you that the town will still be colorful and bright, thanks to the colorful clothing of the ethnic minorities that live there and around, with whom I’m certain you’ll come into contact with. Coming from Lao Cai, whether by bus or motorbike, you’ll enjoy a stupendous landscape of terraced hills. In the northern region of Vietnam riding a motorcycle is common among travelers, both for the unique mountain landscape as well as the road that is, to say the least, unusually spectacular. From Hanoi, for example, it’s 380 kilometers away, and you can also put the bike on a train, get off at Lao Cai and do the last part – about 40 kilometers uphill and curvy – on bike. However the town, being very touristy, is well connected and there’s even a bus station. In Sapa, you can get around well with only your legs or even just rent a bike, even though there are numerous climbs. You can also rent a motorbike for a few dollars, but be careful, if you still haven’t had a driving experience in Asia, this is definitely not the place to learn, considering the changing weather conditions and the impassability of the roads, the slopes, etc. In Sapa there’s a small museum and cathedral – nothing more. But at the museum you can find out about the culture, traditional customs and dress of the area, while the church is a modern structure with a square in front of it, where in the evening you’ll find the town’s inhabitants and curious travelers. The mountains around Sapa have a discreet appeal and are full of rice terraces that descend the valley as far as the villages. The mountain chain around here is the Hoang Lien Son which also includes Fansipan, the highest peak in the country, and there are various ethnic groups that live in its height: the Hmong, the Tay, the Giay and the Xa Pho whom you’ll have the pleasure to meet and certainly get to know, giving the extreme availability and openness toward travelers. All the fields around Sapa create thousands of shades of green and are an example of a typical landscape of northern Vietnam, which allows you the chance to also get up close to the extreme cultural diversity of the country. You’ll find lots of offers for excursions outside of Sapa – you’ll be stormed by Hmong youth that will offer you a tour with them. Or, alternatively you can use a tourist agency. To spend a night in the hills, however it is important that you use a guide who knows the territory well and especially, speaks the local language. Consider too that many people don’t even speak Vietnamese, but other languages that change from one hill to another. I opted for two days of trekking with Mumu Sapa Homestay, an adorable girl who welcomed me like family and stopped me at the bus station as soon as I stepped foot in Sapa. Mumu, in two days of trekking, had me explore the surroundings and villages about 20 kilometers through rice fields, villages waterfalls and shamans. One night I slept at her house together with other hikers and her family – husband, kids and cats and dogs – and I also was able to appreciate the tasty Vietnamese cuisine, rather that of the Hmong, since Mumu and her family are part of this ethnic group. Mount Farsipan (with an altitude of 3143 meter) is the highest peak in Vietnam and all of old Indochina. It’s 19 kilometers away from the center of Sapa, and to get there, you can opt for an old style hike (remember to bring good shoes with you) or, more conveniently, let yourself be transported by zipline for just 600,000 VND, and reach your destination in just 15 minutes without much effort. If you’re in this area of Vietnam, you cannot miss a tour to Bac Ha for the Sunday market: a traditional local market where you can find all the ethnic minorities of the northwest. I’ve personally never seen such a colorful sight. Animals for sale, handicrafts, women, men and children with traditional clothing and hair done up in vibrant colors, typical homes, smells, sounds and scents that will remain impressed in your memory. If you want to buy handicrafts from the area’s ethnic minorities, just walk through Sapa to find lots of stalls and shops that sell hand-made accessories of every type. If instead you want to go hiking but don’t have all the necessary equipment, don’t worry: along the main road near the church you’ll find various stores that sell hiking boots, backpacks, tents, and everything you need for three unforgettable days. Moreover, if Sapa is your last stop in Vietnam and you have to go to China, nearby there’s Lao Cai which, as I said above, is just 38 kilometers from Sapa. Lao Cai borders with China and from here you can pass the border and get to Hekou, which is 3 kilometers from the town’s train station. So bring your hiking boots with you and go discover Sapa!